A recent study at Ohio State University, published in the Journal of the American Veterinary Medical Association, demonstrates an extremely effective means for increasing the return of dogs housed in animal shelters to their rightful owners: microchips. Microchipped dogs were returned two and half times more frequently than dogs without microchips. Cats, it should be noted, were returned twenty times as frequently when they had chips embedded. Shelters that house pets with microchips are able to find the stray animals’ owners in 75% of cases, according to these astounding results. Chips are typically embeeded at a veterinarian’s office, usually at a cost of around $25 to $75. Many shelters are also now providing this service – a trend we’d like to see grow. While the practice is growing, it is still far from widespread. Only 1.8% of the pets in the study were microchipped – and experts estimate that only 5 to 8 percent of all pets in America currently have microchips. Our hope is that the results of this study can encourage even more responsible pet owners to seek out microchipping, in addition to the practice of always ensuring that your pet wears a collar with an ID tag containing your phone number. 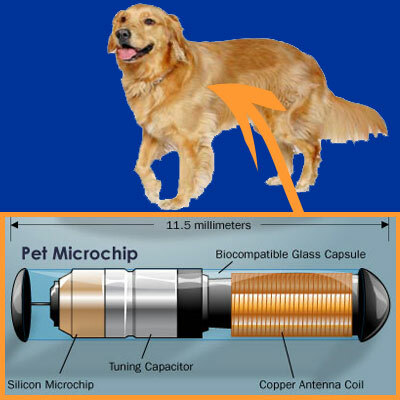 If you do already have a microchip implanted in your pet, please remember to make sure that your registration service always has your correct phone number. The service works amazingly well… as long as the phone number they have on file for you hasn’t been disconnected! And a note to shelters – please remember to use the best possible scanner available and to scan multiple times. In the research study, microchips were not always detected on the first pass, usually due to poor equipment. In the study’s results, owners were found for 72.7 percent of microchipped animals. Among those found, 73.9 percent of the owners wanted the animals back in their homes. We really need to focus on not separating the microchip implantation process from registration. Veterinarians have a great opportunity at an annual wellness exam to scan a microchip and remind the owner of the need to keep information up to date in the registry. Likewise, when shelters implant microchips, they need to tell an adopter how it works and make sure information is in the registry before the animal leaves the building. Another problem – besides disconnected phone numbers and faulty equipment – is that there are many different companies providing microchips and registration databases. As of just a couple of months ago, efforts are finally underway to unify this information thanks to the American Animal Hospital Association. They have launched a website that looks up a pet’s microchip number and determines which company has the appropriate registration information. You can find this service at petmicrochiplookup.org. Shelters and veterinarians feel very strongly about doing everything they can to secure the human-animal bond. Similarly, one of the paradigm shifts I am trying to accomplish is that if I as a veterinarian am trying to protect that pet and preserve that bond, keeping an animal in a home is a critical component. One component of the wellness conversation should be about identification options. Each of our locations has all of their prices posted online, here on our site. Please find your nearest location, and then click Prices to view. Please note that microchipping is not offered at all Zoom Room locations. Read more posts about "Dog News"